Ice skating, Hockey and Sledding are other winter sports you can do in the Lake Winnipesaukee region of New Hampshire. If you lead an active lifestyle, you can be busy doing a variety of sports. Skating is a popular sport these days. There are local rinks available for fun or for lessons. Many kids are on hockey teams and so are adults. For the younger kids you can join a learn to skate program. These usually gear the kids towards hockey. There are also ice skating programs in the area. These teach basic skills for the beginners to more advanced. There are two figure skating clubs in the Lakes region. Magic Blades runs the ice skating program at the Tilton Academy, New Hampshire ice rink. This program teaches beginner figure skating basics and has an end of the season performance. In addition, Magic Blades has a skating program at the Plymouth Ice Center at Plymouth State University, New Hampshire. Central NH Skating Academy runs the program at the Laconia, New Hampshire Ice Arena. Their programs include basic learn to skate skills for hockey and figure skating. They hold performances at the end of each session. Speed skating is also available as a winter sport in the lakes region. You can practice at the local rinks or become a member of a speed skating club. For more information, call (603)366-5708. One Christmas vacation, we went skating and my girls loved it. So, I signed them up for lessons. They've both become quite good and tell me I should take lessons. I've provided a list of a ice rinks in the Lake Winnipesaukee area. There are others but they're further away. Want to Learn More About Ice Skating? 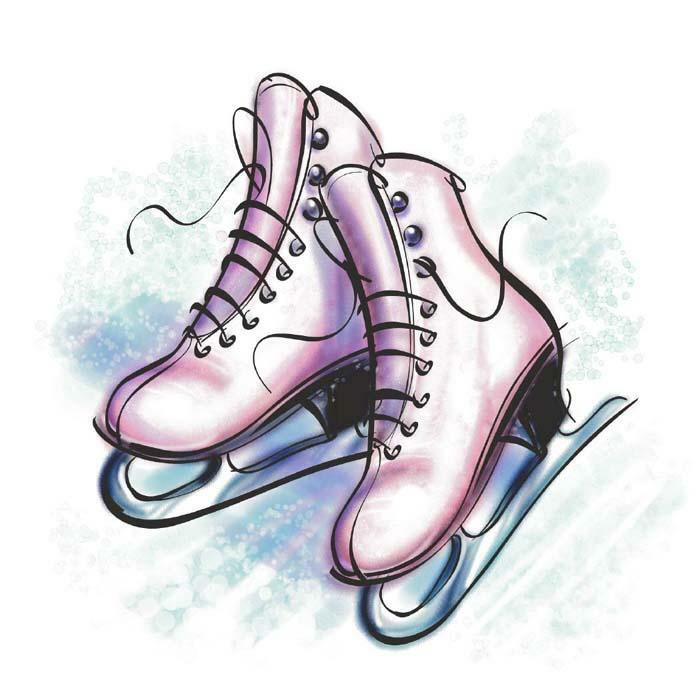 Once you've started learning skating basics, you're able to advance and learn the various ice skating moves. These include gliding across the ice and being able to do some jumps. The benefit of learning to skate in a figure skating program is that the skater gets to participate in skating shows. This is an important aspect of the programs. Plus, the families and friends get to see the progress the skater is making. It's important to practice ice skating safety whether you're at an indoor ice rink or outdoors. Many people are enjoying this sport, so it makes it more fun when everyone works together. Are you ready to try your skills while public skating? You can find some basic skating rules to follow while at an indoor rink. It's also important to follow some basic skating tips when you're outdoors on a lake or pond. If you're unsure whether the ice is safe, always check with the local New Hampshire police departments. In the winter, especially around the Olympics, people take more interest in the history of figure skating. It's fun to find out how figure skating started. When the summer fades and the cold starts to arrive, that's when most skaters begin lessons, they have an interest in creating drawings or posters for their room or school. I've included some figure skating clipart for those who want to use it. There are a variety of places to practice skating. If you're into figure skating, hockey or speed skating, you'll want to find out what is available at the local New Hampshire skating rinks. You can find many places to skate, both indoor and outdoors. 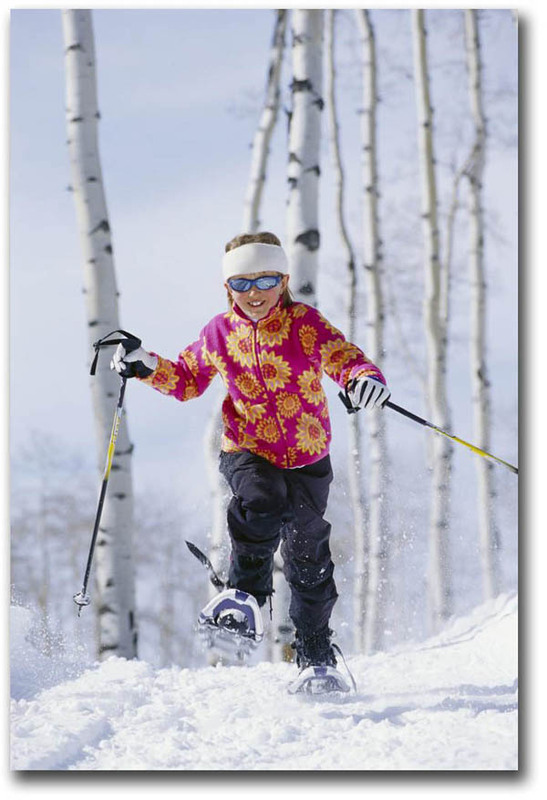 Snowshoeing is a sport where you don't need much equipment. Just the snowshoes. If you're really serious, you can use cross country ski poles as well. What I like is that the snowshoes strap right to your snow boots and you can go through the woods without having to maneuver between the trees like you do with long cross country skis. It's also a good way to keep kids active for a short time. Because you can snowshoe anywhere, it's easy to follow a lot of hiking trails. Everyone loves to sled. All you need is a sled and a hill. We happen to have a great hill near our house. The kids go down the hill and try to reach the pond. We don't even get close because the sled veers off to the side. 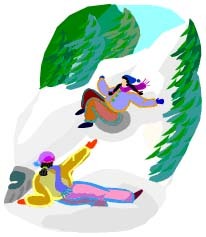 Many towns have great sledding hills. Some are setup just for that purpose. You can call the New Hampshire town Parks and Recreation department to see if they have a sledding hill nearby. Gunstock Mountain in New Hampshire has a tubing park. It's almost like a waterslide but it's on snow instead. You're pulled up by a tow rope and you go down one of four snow packed slides. It's really ice. Everyone hopes they can make it part way up the hill at the end. Every once in awhile someone goes over the hill and everyone cheers, but there are nets to catch you. 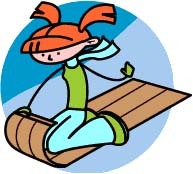 It is one of the fun winter sports. You do have to wait in line and a lot of younger kids aren't good at that.